Finding success with freelance writing is all about making a name for yourself and building out your portfolio of client and work. An excellent way to speed up this process and make yourself look more professional in the process is to rank for your name in Google. There are many ways to accomplish this, but I’m going to provide you with three of the best working methods I’ve been using for a while now. Keep in mind, it’s not just about ranking number one for your name in Google, it’s about ranking as many times as possible and trying to own that whole first page. Each of the methods highlighted below should be possible for nearly any freelance writer out there. The same can be said for anyone simply trying to rank for their name as well. Of course, this will also come down to the popularity of your name and who you have to out rank in the process. For anyone wanting to grow a personal brand and rank in Google for the name, one of the first things that should be done is starting a website or blog of your own — preferably with your personal name as your domain name. 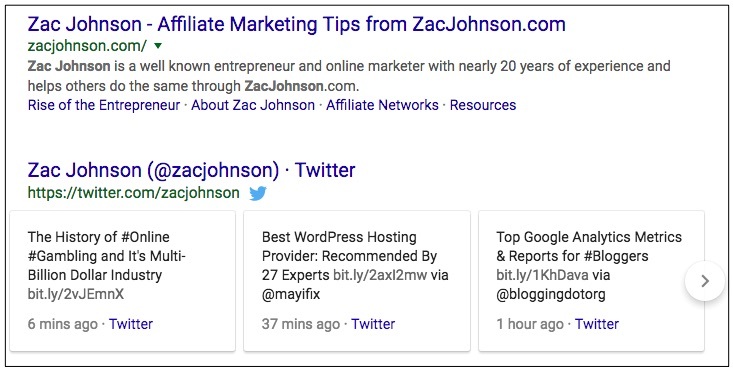 This is what I was able to do with ZacJohnson.com and having it rank #1 in Google for “Zac Johnson”. In addition to creating the site, I continually produce new content and have a thorough “About Me” page which helps the site rank as well. In the screenshot above, you will also notice my Twitter updates are shown right at the top of the search results as well. 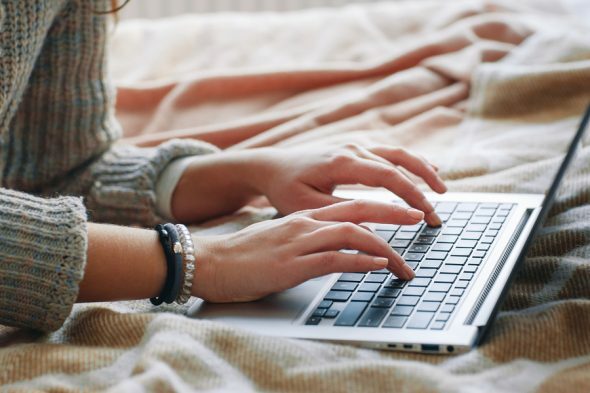 The good thing about having a main website or blog of your own is that you can always refer to it whenever you might be mentioned on other websites or even sharing content through social media. I also have an interesting case with my name, as I share it with a pretty famous professional golfer named “Zach Johnson”, which Google commonly meshes in with my own search results. In addition to having a website or blog of your own, it’s highly recommended to make use of other third party websites or blogs that you might be able to gain an author or bio page from. 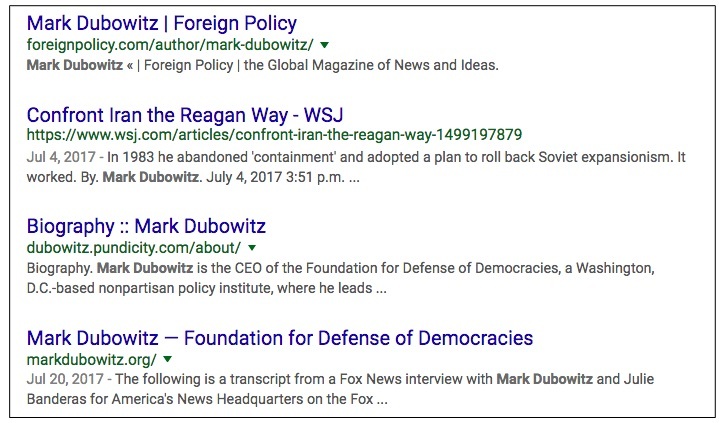 A perfect example of this can be seen for Mark Dubowitz (Medium profile), who is the Executive Director at the Foundation For Defense Of Democracies. We can use him as an example in this scenario because not only does he write for his own web sites, he also writes for other big media sites and has profile pages on high authority sites as well. When searching for his name through Google, you will see that each of these profiles rank extremely well for his name in Google. Being an Executive Director, Mark Dubowitz (CrunchBase profile) also has the benefit of being able to create such profiles on sites like CrunchBase, Wikipedia, Wall Street Journal and other big name sites — all of which are ranking quite well for his name in Google. This is a method that works well for both professionals and freelance writers as well. The more publications and citations you can get under your name, the better chances you have for ranking multiple pages within Google. If you have a name that is somewhat competitive to rank for and is shared by many others, an excellent way to improve your chances of ranking multiple times in Google is to rely on social networks like YouTube, Facebook, LinkedIn, and Twitter. This is something that can clearly be seen if you perform a search for “Gary Vaynerchuk” in Google. 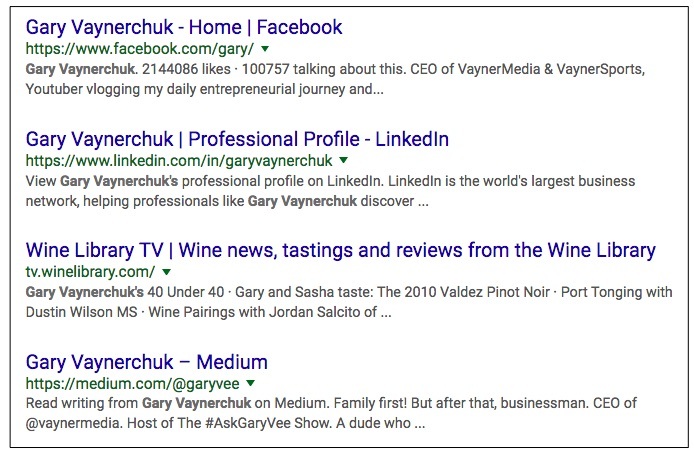 While many sites like Forbes, Entrepreneur and the New York Times continually write new articles around Gary and use his name in the titles, they still don’t have a chance of outranking his main social profiles — thus allowing Gary Vee to pretty much own the whole first page of rankings for his name. While this is just an example of how well this is working for one individual, there is no reason why the same can’t be done for you. Be sure to create as many social profiles on the main networks as possible, while also linking back to them and using your name whenever possible. At the end of the day, Google is going to act as your first impression for whenever someone searches for your name online. While you can’t control what ranks at the top of Google, you can influence where you rank and the chances of outranking other websites. The best way to accomplish this is to have a content marketing and link building plan that includes each of the methods above. Be sure to always link back to your main website and social profiles using your name. This will allow Google to see the reference between the anchor text and the social profiles you are linking back to. Since Google loves social networks like Twitter, LinkedIn, and Google, they are extremely easy to rank in comparison to other sites. Make sure you are using not just your own site properties to rank higher, but also other established sites that already have established authority and link juice passing through them.